Baked Churros are so easy to make with no frying! They taste just as good as a fried churro but are healthier and easier to make. We loved dipping them in chocolate ganache! 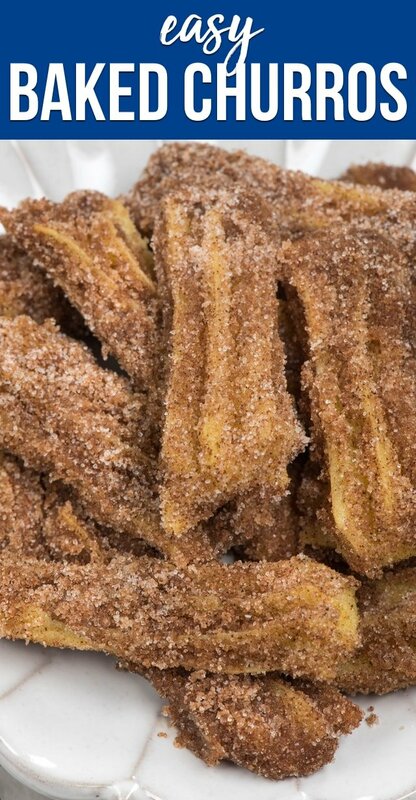 I have lots of churro ideas on this site, but these baked churros are totally homemade and from-scratch, thanks to the sponsorship of AncestryDNA. A few years ago my parents gave Mel and I DNA kits from Ancestry.com for Christmas. They’d done the test a few months prior and my mom started a family tree. I was very excited to see what my DNA story was because I’ve always loved hearing about my family history. Both my grandmothers were a bit of a mixed bag when it came to their origins, but my grandfathers were a different story: we knew their origins exactly. They’d both come to America as babies; my mom’s dad came from Sicily and my dad’s dad came from Switzerland. When I was young, my mom got all the information she could gather from all my grandparents about countries of origin. She then went to work doing the fractions and calculations on a lined yellow piece of paper – I still remember looking at it – and worked out I was 5/16 Swiss and 1/4 Italian and the rest hailed from different places in Europe. So when my mom got her DNA tested through AncestryDNA and it came back without any Italian DNA at all, I was very interested to see what my results would be. It turns out that I have zero Italian DNA. It’s that funny? According to AncestryDNA, my ancestors are 20% from the Iberian Peninsula and 20% from Scandinavia and the rest is a mix between all of the other European countries except Italy. When Ancestry contacted me about spreading the word about their service and their Summer Sale (get your kit for just $59), I jumped at the chance. I think it’s so cool that I found out some new stuff about my family story that I never even knew and I know a lot of you might be interested. Not only do I love seeing my DNA story with AncestryDNA (it follows my ancestors as they pop up during the years and move about the world; it turns out BOTH sides of my family has Swiss origins), but once your DNA is loaded in their system it can find matches that you may not know about. This is great for a whole host of reasons. One great thing is that it can connect you with people around the country and world, but I’m excited about it because Mel’s mom was adopted and we don’t know much of her history. Through Ancestry I’ve found some common ancestors that we think might be relatives of her birth parents. How cool is that? AncestryDNA sent me a test so that Jordan could also check her DNA. It turns out that 15% of Jordan is also from the Iberian Peninsula and 33% is from Scandinavia (Mel also has that in his story). Ancestry asked me to research my DNA story and share a recipe inspired by what I found. Food is a necessity but it’s also part of our culture and is interwoven into our family and traditions. Every day we connect to each other and our world through food and this summer Ancestry is inspiring people to buy DNA kits to connect to their heritage through food. When Iberian Peninsula came up as my #1 DNA origin, I was stumped. I’d always figured cannoli were the dessert of my heritage, but I was wrong. I googled Iberian Peninsula Desserts and guess what came up first? Churros! I mean…I can’t think of a better dessert to represent me than Churros. Dough dipped in butter and cinnamon sugar and then dipped in chocolate ganache? It’s like they were made for me! This Baked Churro recipe is SO easy to make. I have lots of churro recipes on this site, but I’ve never made them in the traditional way. Normally I use biscuit dough or something like that for the churro part, but this time I made churros from scratch. Making homemade baked churros from scratch is really easy. Easier than I thought it would be! The dough comes together easily in a saucepan. You melt together butter, water, and salt until it’s boiling, and then you stir in flour and eggs, resulting in a thick paste-like dough that’s perfect for piping churros. To make your churros, you simply fill a piping bag and pipe the size you want. I made these small and almost bite sized, but you can also make them long like a traditional churro. 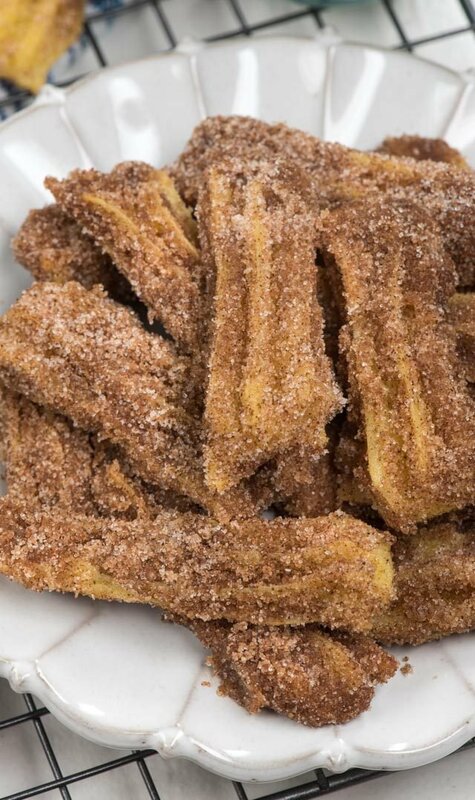 These churros are baked not fried, which makes them even easier than the traditional recipe. Once they’re baked, you dip them in melted butter and then roll them in cinnamon sugar. 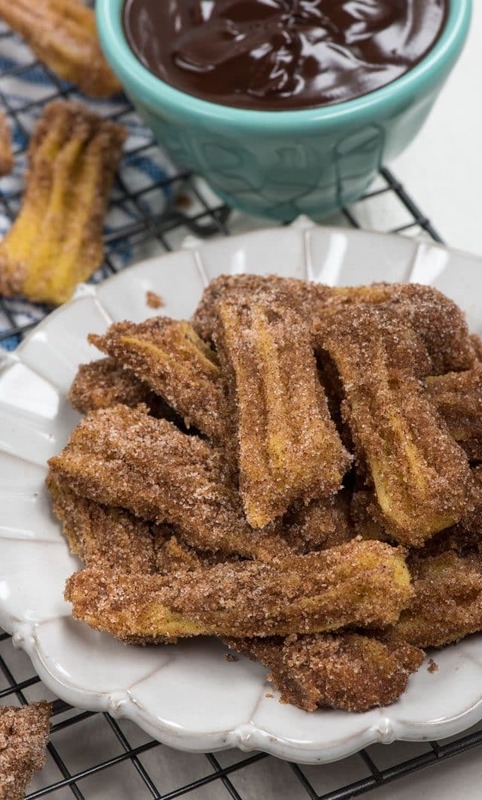 You will never know these churros aren’t fried and they’re so much easier to make! Slice your butter into tablespoons before adding to the water or it’ll take forever to melt. Stir the flour in completely. It’ll be thick but it will create a thick batter once it’s all mixed in. Add your eggs one at a time and stir them well, working fast. The mixture is hot and you don’t want scrambled eggs! Use a 1M or star tip for traditional looking churros. Preheat oven to 350°F. Line three cookie sheets with parchment paper or silicone baking mats. Place water, 1/2 cup butter (sliced into tablespoons), and salt in a large saucepan. Heat over medium heat until butter is melted and stir occasionally until mixture boils. Turn off the heat and stir in the flour. A thick paste will form. Add eggs, one at a time, mixing well after each addition (work fast to avoid cooking the eggs). It'll seem like the eggs don't want to mix in but they will. Place the churro batter in a large pastry bag fitted with a star or 1M tip. Pipe churros in desired size and shapes onto cookie sheets. (This recipe makes approximately 60 3-inch long churros or 25 7-inch long churros. Bake for 20-30 minutes (depending on size), rotating pans as needed, until churros are baked through and lightly golden. Cool slightly, or until you can handle them. Melt remaining 1/2 cup butter in a medium size bowl. Mix sugar and cinnamon in another bowl. Dip the churros in the butter then roll in cinnamon sugar. Serve immediately with dipping sauce. To make chocolate ganache: place 1/3 cup heavy whipping cream and 1 cup semi-sweet chocolate chips in a microwave safe cup or bowl. Heat for 1 minute, then whisk until smooth. To make caramel dipping sauce: place 20 unwrapped caramel squares and 3 tablespoons heavy whipping cream in a microwave safe cup or bowl. Heat for 1 minute, then stir until smooth, reheating as needed. Stir in 1/4 teaspoon kosher or sea salt if desired. 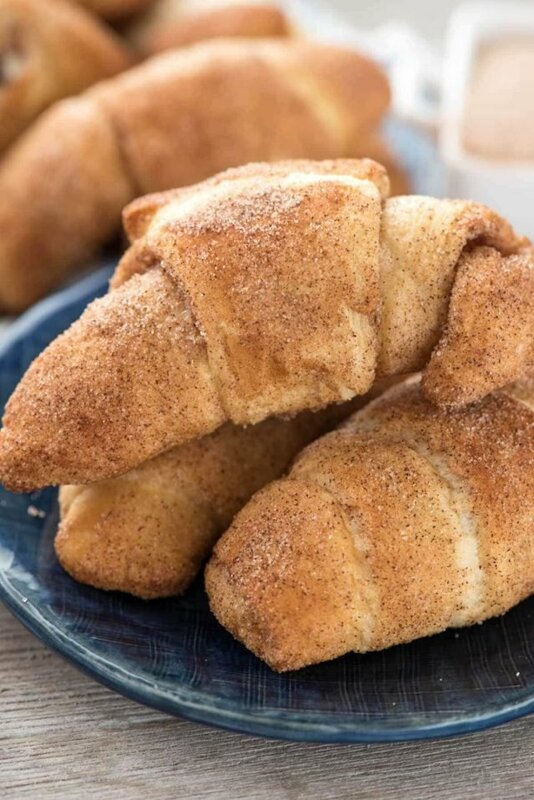 Crescent Roll Churros are another easy way to make a baked churro! 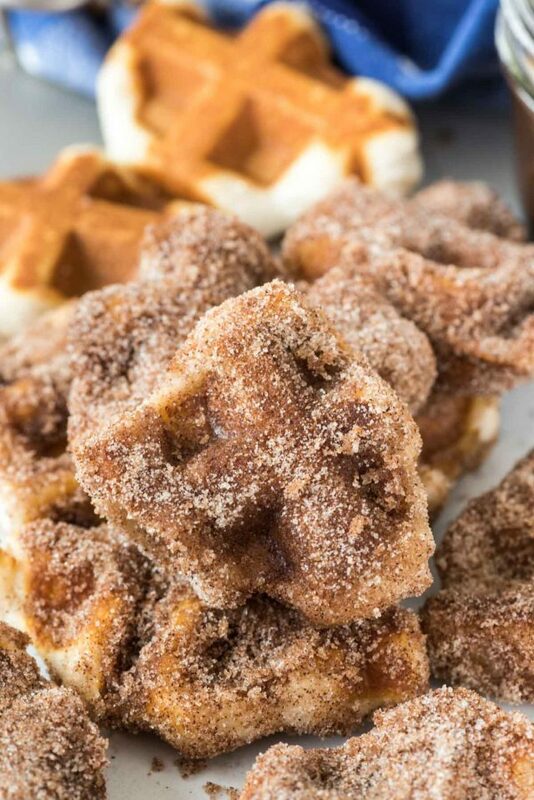 I also love using biscuit dough to make Churro Bites! 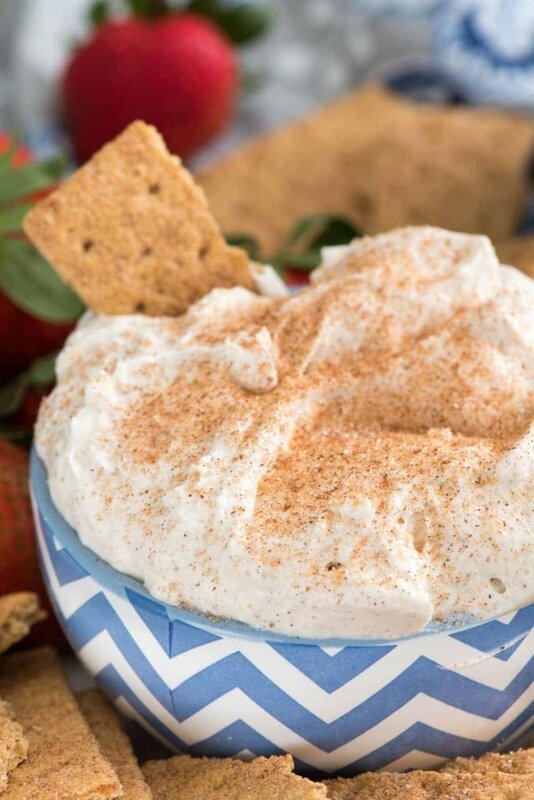 Skip the ganache and make Churro Cheesecake Dip! This post was sponsored by Ancestry.com. All opinions are 100% my own. I can’t wait to try this! Making churros requires so much oil and I also don’t like fried treats. Thank you for sharing the recipe. 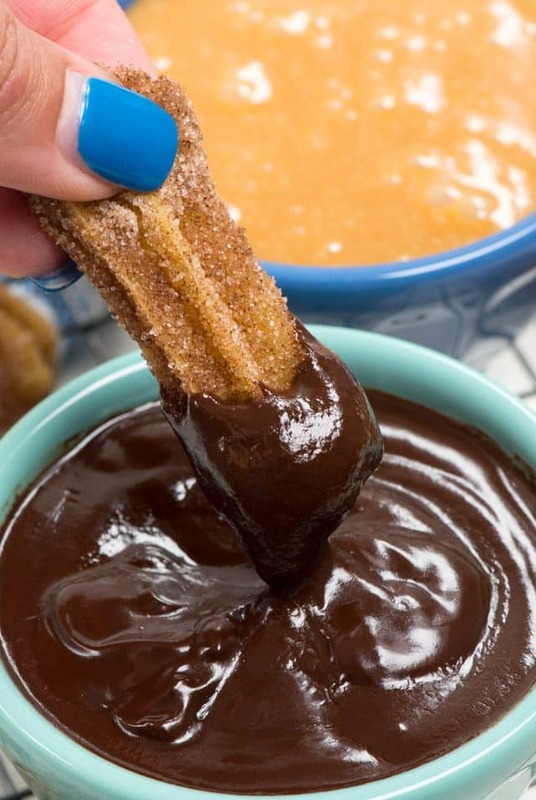 Oooooohhhh I love the idea of baking churros!!! Also I’m so intrigued by the ancestry stuff, my great grandpa is from Sicily but I wonder if genetically speaking that’s Italian at all!